Atmosphere is one of those acts that you just have to experience live. With more than a quarter of a century in the game under their belt, the Minnesota duo have made a name not only for themselves, but for indie hip-hop as a whole. Since building their own record label, Rhymesayers, from the ground up more than two decades ago, rapper Sean “Slug” Daley and producer Anthony “Ant” Davis have churned out eight studio albums, toured all over the globe, and established their own music festival in the Twin Cities. Moral of the story? These guys are the real MVPs. Fishing Blues, which dropped back in August, is the latest project to illustrate just how well Slug’s layered lyricism pairs with Ant’s hard-hitting productions. While on tour to promote the album, the dream team made a stop in Omaha, where we were lucky enough to catch their high-energy set at the Sokol Auditorium. From the moment they walked on the stage, which was adorned with a fish tank-motif in mind (mini castles, plants, and a bubble machine were all accounted for) we knew we were in for a night for the books. 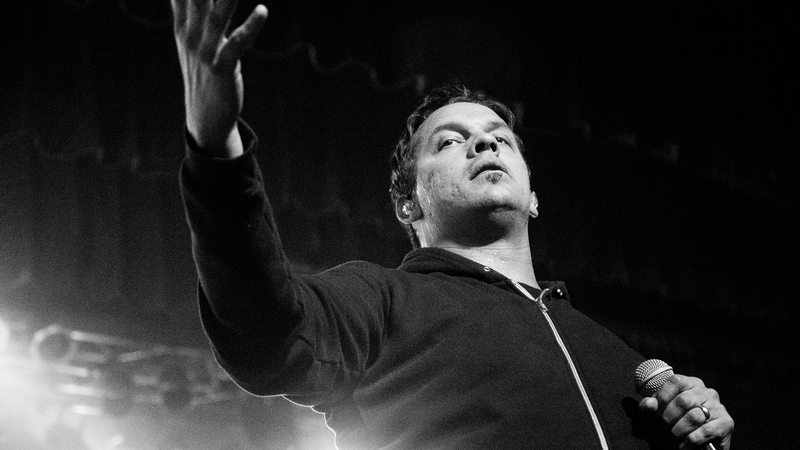 From their new music to classics like, "Trying To Find a Balance” and "Sunshine", Atmosphere made sure to keep fans from every end of the spectrum happy. Check out the images from the show below and make sure to track them on Bandsintown so don't miss them when they're in a city near you.